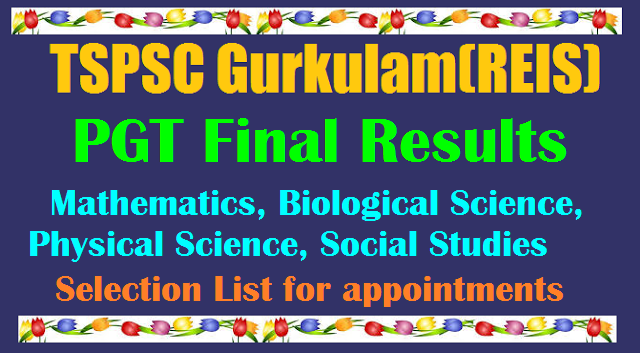 Telangana Gurukulam PGT(Mathematics, Biological Science, Physical Science and Social Studies) Zone wise Selection List Selection Download|TS Gurukulam Post Graduate Teachers Direct Recruitment (General) to the post of Post Graduate Teachers (Mathematics, Biological Science, Physical Science and Social Studies) in various Residential Educational Institutions Societies 475 candidates with the following Hall Ticket Numbers have been provisionally selected for appointment to the post of Post Graduate Teachers (Mathematics, Biological Science, Physical Science and Social Studies) in various Residential Educational Institutions Societies Notification No.13/2017, Dt: 14/04/2017. PGT (Mathematics, Biological Science, Physical Science and Social Studies)Final results/ Zone wise Selection List For appointment download from here. It is hereby notified that on the basis of the Main Examination held on 18/07/2017 and 19/07/2017 and subsequent Certificate Verification process held on 20/10/2017, 31/10/2017, 01/11/2017, 02/11/2017, 08/12/2017, 15/12/2017 and 19/12/2017 at Sankethika Vidya Bhavan, Masab Tank, Hyderabad for Direct Recruitment (General) to the post of Post Graduate Teachers (Mathematics, Biological Science, Physical Science and Social Studies) in various Residential Educational Institutions Societies 475 candidates with the following Hall Ticket Numbers have been provisionally selected for appointment to the post of Post Graduate Teachers (Mathematics, Biological Science, Physical Science and Social Studies) in various Residential Educational Institutions Societies Notification No.13/2017, Dt: 14/04/2017. However, the results of the VH candidates will be declared later. The selections are published here-with subject to the following conditions. 1)That success in the Examination confers no right to appointment unless the appointing authority is satisfied after such enquiry as the case may be considered necessary that the candidate having regard to his/her character and antecedents is suitable in all respects for appointment to the service. Besides that, the Commission reserves the right to take any action as it deems fit in the circumstances of the case, in terms of the provisions as notified in TSPSC Rules of Procedure published in Telangana State Gazette No.60., Dt: 28/12/2015. With this Notification of selection, the General Recruitment process notified vide Notification No.13/2017 for the post of Post Graduate Teachers in various Residential Educational Institutions Societies has been finally concluded except VH vacancies. The selections are subject to the final outcome of W.P.s and other cases pending, if any, before the Hon’ble Courts of Law ..